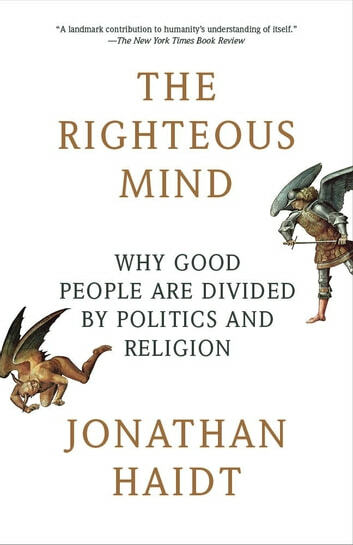 The author spends very little time talking substantively about politics and political decision making. Instead, this is a too-long combination of literature review and theoretical case studies that provides the reader with a rather sweeping survey of moral psychology over the last two centuries. Some interesting stories about experiments. And maybe a chapter's worth of useful things to say about how we operate in the public arena. A lot of good information in the first two parts. Well sourced and researched. He lost me when he gave religion a free pass, dismissing the evidence provided by authors like Dawkins and Harris. He instead chose the address a parody of their work and skip over the damage that the certainty of religion can enable. Once I saw the oversimplification of his conclusions, the rest of the book was frustrating and unhelpful to me. I'll try to take the insights forward with me as I ride my elephant into the sunset. But I'm afraid all this book has done is depress me, and make me feel like there really is no hope for humanity. You will never regret ever reading this book. It will change how you think about politics, your neighbours and how they vote. A bit far from my terra incognita. 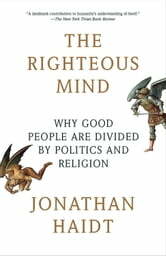 But provides me with some insight on how to deal with different perspective on politics and religion, although not a clear cut one.